Virtualization of a physical machine is the process that converts a physical operating system (OS) partition into a virtual hard drive (VHD). The process will basically create a complete copy of your physical machine’s OS to be used by a host. You can boot a virtual disk on “hosted” virtual machine programs, or even directly on server’s hardware using “bare metal” hypervisors. VMware - Supports virtualization of both Windows and Linux with a tool called vCenter Converter. It’s able to convert local and remote physical machines without any downtime. Microsoft Hyper-V - Only supports Windows virtualization. 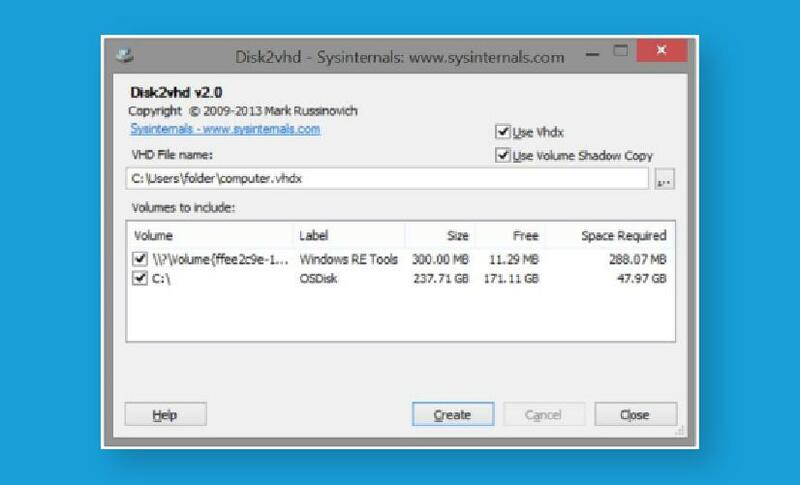 Microsoft Sysinsternals provides Disk2vhd which converts a physical system into a VHD. Parallels - Even though it offers VM programs for Windows, Linux and Mac operating systems, it only provides a tool (known as Parallels Transporter Agent) for Windows and Linux. Oracle VirtualBox - This open source VM program, unfortunately, doesn’t provide any user interface tool and the process is pretty much manual but supports both Windows and Linux. Although, you can use Disk2Vhd virtual disks. We’re going to be using Disk2vhd for this guide, and it only supports Microsoft operating systems. Disk2vhd runs on Windows Vista, Windows Server 2008, and higher, including x64 systems. After you have downloaded, you need to unzip it before executing since it’s a compressed file. When it is unzipped, you can either run it locally or transfer to a remote computer that you would like to virtualize. Now that you are ready, you have two options: You can either invoke the user interface double-clicking the file or use the command line. We will use the user interface for this guide. The creation process should take some time, probably an hour or more. It depends on the disk size. This is where your virtual disk is going to be saved after the process is done. Required. Microsoft Hyper-v programs only works with Vhdx images. Required. It copies a version physical system at the moment you click on the “Create” button. With this feature enabled, you will be able to continue using your physical machine without damaging the virtualization. Any changes to the system after that won’t affect final image. In this section, you have to select the volumes you want to visualize. Your physical machine can have many disks, and each can be partitioned into many volumes. Disk2vhd will create one VHD for each disk on which selected volumes reside preserving the partitioning information of the disk. However, only selected volumes will have data copied. It’s important to select system partition and, if available, Windows RE/Recovery/System Reserved partitions. Microsoft Virtual PC supports a maximum virtual disk size of 127GB. If you create a VHD from a larger disk it will not be accessible from a Virtual PC VM. Alternatively, if you use Disk2vhd command-line options to create VHDs, it can be used in scripts to automate the process. It only has two parameters, the volumes you'd like to convert and the path to the VHD file. Use "*" to include all volumes, or specify the volumes by drive letter (e.g. c:). Once the process is over, you can create a VM with the desired characteristics and add the VHDs to the VM's configuration as IDE disks.